The k.g.b. empire is taking over Vancouver! If you’re local & don’t want to wait until my next market or craft show, you can now pop down to a few fabulous Vancouver retail shops & stock up on Cagey Bee goodies. I love this city & am so thrilled to be part of such a supportive community. I really love the way we showcase local designers. Main Street, Commercial Drive – the only chain stores to be found are Starbucks (which are getting a little ridiculous in their ubiquity, I’ll admit). This a new shop that just opened last year. A beautiful location with a fantastic assortment of art, fabric goods (the quilt in the front window had me drooling), jewelry & all sorts of creative wares. You can find a selection of my lockets, postcard packs & prints in stock. The owners of Chic Winds are incredibly sweet & encouraged me to branch out into retail after spotting my work at one of my markets. They carry a mix of local artists, including First Nations jewelry and artwork, plus a line of Tibetan jewelry picked up on their travels. 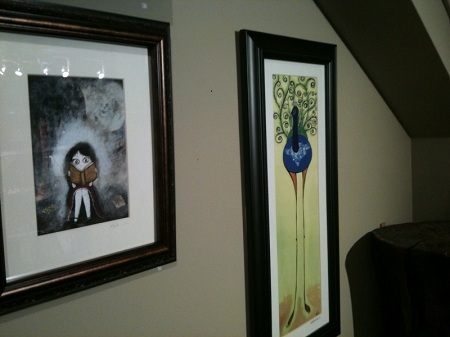 I was happy to see one of my prints hanging in such good company, a print by painter April Lacheur of Yapes Paints. At Chic Winds you can find my lockets, a handful of Scrabble tile pendants, 5×7 matted prints (not for sale anywhere else), wood block panels & a few original paintings too. Oh, Plush. You guys just rock. The girls manage to cram so much Vancouver fabulousness into such a small shop that I’m constantly surprising myself by noticing new items that I seemed to miss before. Felted soap in Chai flavor? Pouches by kukubee? Yes, please! You’ll also find some Cagey Bee lockets, mini wood panel prints covered in shiny resin plus a couple of original paintings on canvas. Pingback: A Cagey Bee » Blog Archive » Happy New Year!